I know that each of us has a different picture of the Rainbow Bridge. My vision is shown in the Rainbow Pictures that I make. always near, never doubt that. I come to you in many ways. you healing. I am in the gentle rain that falls and brings new life. with others at PetLoss I am there. After all I lead you there. and make me laugh to bring a smile back to my heart. at those around me I see all are strong and whole again. us close to your heart as we started our journey to the Bridge. love can be given in a heart beat and last forever. time to go they took that love with them to the Bridge. they remember you and your face is the one of love. trust to a lonely heart. ones who opened your hearts to true love and let us in. 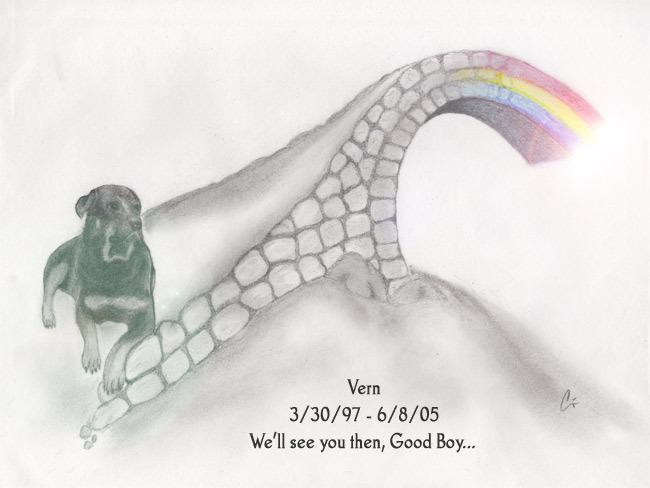 I have thought very hard over the last four years about how I picture Rainbow Bridge . As you said we each have our own personal images in our minds and hearts of what we think it is like there. One thing that I know for sure is that when I picture where my sweet golden boy is now waiting for me it has to be a place worthy of one so special. A place of peace, love, great joy and endless freedom to run and play. Because they teach us so much of unconditional love while they are here I believe that Rainbow Bridge is a place where all live in peace and harmony filled with love. Because they took time to smell the roses and never let a flower leaf tree or anything else go by without taking time to sniff it I believe that Rainbow Bridge is filled with wonderful beautiful flowers trees and plants to sniff. Because many enjoyed nothing more then a nap in the sun I believe there are beautiful banks by a quiet stream where all can enjoy their sunny days with a peaceful nap. Those who were old or sick before they left us to run free to the Rainbow Bridge are restored to youth and health the moment they arrive at the bridge. Because many could not run and play as they got older or became ill here on earth I believe there are lush green meadows and fields of flowers where they can all run like the wind to their hearts content. Because some go to Rainbow Bridge never knowing the warmth of love of a home I believe there is always a warm place to go inside and be with friends. I believe that as they play each will one day see their special human and stop playing and run as fast as they can to greet them. What a wonderful day that will be for all of us. The night my Rudy Rabbit died he came to me in my sleep. He showed me where he was going. I watched him hop away down a patch lined with the most beautiful trees you've ever seen in your life. The path wound upwards & into the clouds. Above the clouds was a large rainbow. Much like the picture Carewolf posted. I also saw a glimpse of this wonderful place after we sent my beloved Suzie Q to the Bridge. She was resting in the most beautiful forest. Though the tree cover was thick it still seemed very bright & peaceful where she was. One beam of light shown upon her as she layed amongst the most colorful leaves you could ever imagine. Colors I've never seen on this earth. I know in my heart these were real glimpses into place we will all someday travel to. A wonderful place where our babies wait for us. I imagine Rainbow Bridge just like it is depicted in all the post I have ever seen about it. Beautiful meadows with fields and fields of flowers with ponds and lakes where the animals can go swiming in. I can just imagine my beautiful Beau their making friends with other dogs and cats, but sometimes I imagine him lying under a tree when the sun sets and him thinking of me. I miss him so much. I wish I was with him. We used to go see the sun set all the time when we were up at the lake. It breaks my heart just to think of him. I believe the rainbow bridge has all the fields, ponds, and woods that are all posted here, but keep in mind who lives here. All the animals waiting for thier families can play with each other, but they need more to keep active and engaged--they are all healthy again! There are places full of balls of yarn for those playful kitties--and don't forget the balls with the bells and the pipecleaners all rolled into springs! Then, my personal favorite, the area where it rains tennis balls for all those energetic tennis ball chasing dogs to run and fetch (that's where my Zeus spends most of his time). There are sunny spots to nap in, and for the pets who love the rain, there are those damp areas too. Our furbabies are in thier version of heaven waiting for us. How else can we picture them? They miss us, but they are all doing what they love best (besides us) - whatever thier temperment. I can't wait to see my Zeus at the rainbow bridge and have him show me around and see if my vision is correct. I hope so. Mom to Zeus (at the rainbow bridge), Teddy "Bear" Roosevelt, and Domino the wonder cat. Rainbow Bridge would be my idea of Heaven, with all those animals there! 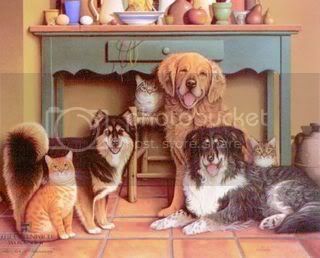 What I am curious about Rainbow Bridge is, the idea is that our pets wait for us there. But (at the risk of getting too technical) - my dog was my father's dog first, and my father passed before the dog. The thought of them being reunited is somewhat comforting to me but theres the whole issue of does the dog go to my father or wait for me? I think I am overanalyzing the concept of Rainbow Bridge. But regardless of that, the main thing to me is that it is a place where they have total freedom (for example, there are no cars to be hit by) and that they know the love we have for them. I've read a few storied from people who said they had a near death experience. Some said they met their pets on their journey and were able to communicate with them. Some say our pets are able to create an environment that makes them comfortable, including a house that might be close to looking like one where they lived. I think in this dimension time isn't the same as on Earth and they may not even notice we aren't with them by the time it's our turn to join them. I wondered what Alafair's idea of heaven is and I thought it might look like our house and yard - only with much better upkeep. Since Alafair's passing - going on two weeks this Tuesday - I've been trying to clean up the yard. She loved being outdoors. She would have been the perfect cat for a farm. When I'm working in the yard I feel closer to her. I wish I would have kept it up better while she was alive. I definitely see meadows, filled with brightly colour flowers and trees, grass long enough for them to run about in and hide in while playing with each other. I see a beautiful stream with clear clean water they drink from. I picture the bridge but that the only cross it to enter - that they each take turns of keeping guard at the bridge constantly waiting for all the new furr baby angels to pass through so they are greeted with love and friendship. I imagine an atmosphere so filled with love, happiness and so carefree with no fear or pain, a fun filled place were it's always play time or chill time to laze about. I wish I could be there to with my little kitties - some day though when its my time - I believe I'll stop by the Rainbow Bridge and call out to them and take them off to our own little part of heaven, reunited for always. Every night I go to bed I close my eyes and the first image I have is of myself crossing over to the other side. Just after I make my way through the light I see a really green field. 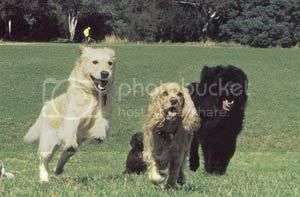 And since I am imagining this the dogs I have now are crossing over with me. God knows how I pray nothing happens to me before my babies I have now. I can only imagine how they would feel not seeing their mommy again. In the distance I see Molly and Biscuit and other love ones I have lost. I call out to Molly and Biscuit and they come running toward me. I do not know why I do that because it only makes me feel worse. I currently have four dogs right now, I am not sure I would be here on this earth if it was not for them. I do not want to force myself to the other side, because I am afraid of going to the wrong place and never seeing them again. A woman once told me she started living her life better so that she would be with her dog again. She is probably right, our pets make us happy and heaven is a happy place, so I am sure all our babies are there. when my cricket left us after a wonderfull life of 19yrs. 3mo. she met up with all our other kids who went before her....Jethro, Buck, Bo, Cayuse, BooBoo, Tiggie, Tiggie2, Moma Baby, Mousse....so you see Cricket had a lot of bro./sisters to meet and play with. 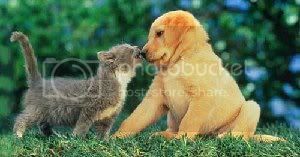 When the day comes for me to go Home I will be tackled by and totally enjoy the wet kisses from them all. Rainbow Bridge Place is always filled with fun and love till we meet again! I picture Rainbow Bridge as I would imagine it to be, a Rainbow Bridge. One side is connected to this mortal coil, with a big, beautiful gate. At that end, all of my fur babies I have ever had and loved, and especially my Kuma, are waiting for me and my family. 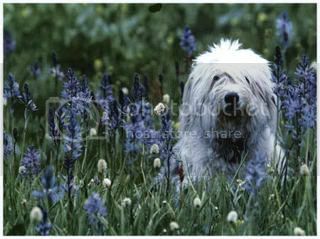 They are frolicking and playing as they wait, in a green meadow, with clear, crisp steams and wildflowers galore. The bridge is crossed, and you enter into life eternal with your fur babies and family, walking the bridge together. On the other side, another gate - a massive, beautiful gate - and a huge expanse of green pastures, tall trees of all kinds, clear streams, flowing waterfalls, fluffy white clouds, tall and expansive mountains - everything you and your fur babies could ever need or want... all there for everyone to enjoy forever in eternity with their faithful companions, family and those they loved so dear. AnimalsAreGodsGifts - I understand what you mean. I still feel heartbroken over the loss of Kuma, but at the same time - some part of me feels, strives, wants to be a better person then I ever have been. I believe she would want it that way, whether it be for other fur babies or for people, she would want me to live life to the fullest, as they say - and be as happy and helpful as I can. That way, I ensure that we will all meet together at the Rainbow Bridge. It is an odd feeling of sorts to think, after such a loss and tragedy, that you could even be any better then you already were, because your mind is so distraught and distracted - but somehow it is true. I believe it is our babies talking to us and telling us, guiding us, leaving messages from God to help us through our time on earth, until we are ready to join our babies. The pictures are beautiful! I love the idea for this thread too. I always believed the Rainbow Bridge was a fantasy, not reality. However, I thought maybe I just don't understand it enough and will warm up to the idea when I learn more because in the past, I believed God was a myth, and now I am a Christian. One thing I am certain about: Emily is not hissing at and smacking Wilbur like she did the whole time they lived with me because in heaven all people and animals love each other. Tobi the big brown dog crossed the bridge just a few hours ago. Her friend Milan, the pussycat neighbor who passed over just a few weeks ago, was waiting for her. They are playing hide-and-seek for fun...something they could not do on this side. Tobi's Heaven -- where cats love being chased... Such an alpha opinionated dog kept me so safe here, wonder if there's room for her sass over there? But what is this wonderful place like? Who has left your life. So we can play all day. Has got to go away. There’s a place where it rains tennis balls. There is a barn made of yarn, and crawling with mice. We can eat what we want now, too. Never again do we have to beg for more. And look at your happy eyes. Jump right off the Bridge and fly. Right at Heaven’s golden door. That was absolutely beautiful and made me feel better tonight. Thankyou! I did a lot of web searches for Rainbow Bridge pictures and am saving all of my favorites that don't have watermarks. It seems to be impossible to find one with a semi-circular rainbow, yellow sun, blue sky without clouds, short green grass that is flat and looks real, crystal clear blue water that looks real, a realistic waterfall, and a wide bridge with animals on all seven colors walking both directions. I can't even find pictures to combine to create that scene. I do not know how to create a new image from scratch or have Adobe Photoshop for altering and combining images. Can someone help me, or am I asking in the wrong place? I believe that rainbow bridge is full of green meadows, and gentle breezes. All the fur babies are friends, and they all play together. I also believe that if an animal loves to play in the snow, there is a special place for them also. I think that it would be full of the things our fur babies enjoyed while they was here on Earth, and there are special angels that take care of them and play with them, and keep them company while they wait for those they left behind. Yes, I believe that there is a bit of everything, even winter snow, and autumn leaves for our babies that enjoy these things. And warm spring days, and cool summer nights. Whatever makes our babies happy, that is what they have. For I am sure that not all would enjoy the same things. And I believe there is lakes they can swim in, and trees they can climb and sleep in, or under. I believe that it is many things for all our babies.